If you have a sweetie who is a manly sports-loving no frills sort of man, it can be very difficult to find The Perfect Valentine’s Day gift. But look no further than the Finger Lakes Art Cooperative in Auburn. 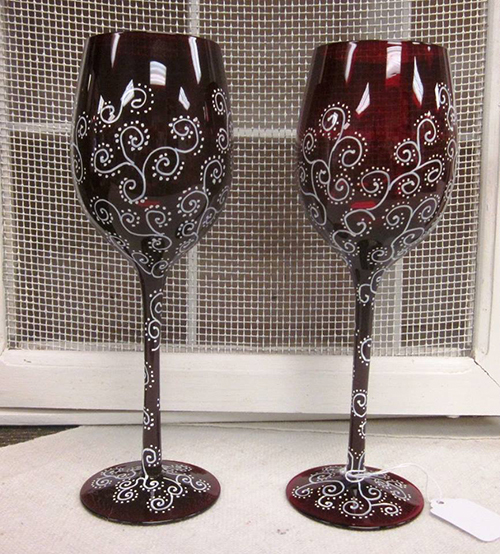 You will be wowed by the breadth of hand-made items by Finger Lakes artists. Did you recently spend a romantic weekend in the Finger Lakes? Surprise your guy with a painting or print of a spot you visited. Every time he walks past it, he will be reminded of the great time you two spent together - alone. Sort of a wall art souvenir of a passionate weekend. Maybe some scented soap would fit the Bill or Tom or Harry. There is a selection of hand-made organic, all natural soap made with jewelweed which stops itches and skin irritation. Winter is the time for all that so sooth his skin. The carved wooden branches and thread spools are quite intriguing. Each one has a weathered, ancient face which looks like a guiding spirit from The Hobbit or Star Wars or such. If your love likes these films perhaps something will resonate with him. There are funny and romantic hand-made cards, cups and mugs. Can your lover wear a hunky amulet? One strung on leather with a pottery medallion might be the perfect signature piece for him. How about a bottle of a Finger Lakes wine served in personalized wine glasses? This artist also takes commission for custom-made to order wedding and anniversary presents. There are stained pins and earrings; framed imaginative collage work; photography with local and international images; Theorem paintings; quilts and bags; a children’s about duck at Hoopes Park book written and illustrated by a local artist. Almost every week, a new member joins the Cooperative and shares their work with guests. Maybe the two of you could take a painting or pottery class together. Check out the schedule on their website. The Finger Lakes Art Cooperative, 101 Genesee Street, Downtown Auburn, has the work of 34 artists on display and is open Tuesday – Friday 10 am – 5 pm; Saturday from 10 am – 4 pm and closed on Sundays. The shop also participates in Auburn’s First Fridays offering refreshments, demonstrations and more each first Friday throughout the year. If you have a sweetie who is a manly sports-loving no frills sort of man, it can be very difficult to find The Perfect Valentine’s Day gift. But look no further than the Finger Lakes Cooperative in Auburn. You will be wowed by the breadth of hand-made items by Finger Lakes artists. There are stained pins and earrings; framed imaginative collage work; photography with local and international images; Theorem paintings; quilts and bags; a children’s about duck at Hoopes Park book written and illustrated by a local artist. Almost every week, a new member joins the Cooperative and shares their work with guests. Maybe the two of you could take a painting or pottery class together. Check out the schedule on the website. The Finger Lakes Art Cooperative, 101 Genesee Street, Downtown Auburn, has the work of 34 artists on display and is open Tuesday – Friday 10 am – 5 pm; Saturday from 10 am – 4 pm and closed on Sundays. The shop also participates in Auburn’s First Fridays offering refreshments, demonstrations and more each first Friday throughout the year. Check out their website at www.flartcoop.org.